The Internet’s openness has resulted in its greatest success and arguably its darkest failures. The ideology of Internet Freedom has its values routed in capitalism – where markets are free, and the government doesn’t have control over them. On the flip side, a regulated Internet fuels fears of totalitarianism – where the state holds total authority over a society. Needless to say, the issues surrounding net neutrality verses internet governance are sensitive, and have remained a heated topic for many years. Proponents of net neutrality want to maintain the internet as “freedom of expression”. Their guiding principle is an internet where ISP’s or governments treat all data equal on the Internet. Those that support internet governance want the ability to block, speed-up, or slow-down traffic at their own discretion. This would equalize the playing field of ISPs and entertainment providers, because ISPs would have more control over what is being sent over their network. Proponents of internet governance argue that data ‘control’ would guarantee quality of service, and would help to address the growing threat of piracy, because P2P protocols and other methods used to pirate content would be filtered (which is a politically correct way of saying “blocked”). In this scenario, a provider could drop all P2P packets, working off the assumption that all P2P traffic is pirated content. But this could adversely affect legitimate services such as Skype, which uses P2P technology. Another concern is that if the internet became regulated, this could lead to a premium charges on content such as video streaming, communications, or gaming – services that either need a lot of bandwidth, or require minimum latency. An ISP could potentially discriminate against any communication protocol, user, or company, with full impunity. The danger is compounded when governance favors one user or competitor over another, or discriminates any combination of, content, websites, platforms, or applications. For these reasons internet governance is largely viewed as a hindrance to future innovation and competition. And that brings us full circle to capitalist ideals. PIPA – A bill introduced on the 12th of May 2011, designed to empower copyright owners to go after perpetrators which have infringed on copy written materials such as illegal sales, counterfeit goods, or anti-digital rights management. This is especially targeted to those registered outside of the USA. ACTA – This agreement was signed by 31 states as well as the European Union on 4th of February 2013. The goal is to establish an international legal framework for targeting copyright infringement on the Internet, medicine and other counterfeit products. There is a common thread in these initiatives. They all attempt to police the internet – mainly in jurisdictions outside of the USA. There is mounting pressure from the US government, the entertainment industry, and consumer goods companies to crack down on copyright infringement. Twenty years ago internet bandwidth wasn’t high enough to stream video in real time. But the 2000’s changed that. As throughput increased companies began to emerge and offer entertainment streaming services for music, video, and gaming. Initially this was for low quality content, but consumers didn’t seem to mind. By the end of the decade, high definition video could be streamed in many countries around the world. As the internet primed itself for high definition, ISPs began to argue with entertainment companies running OTT. 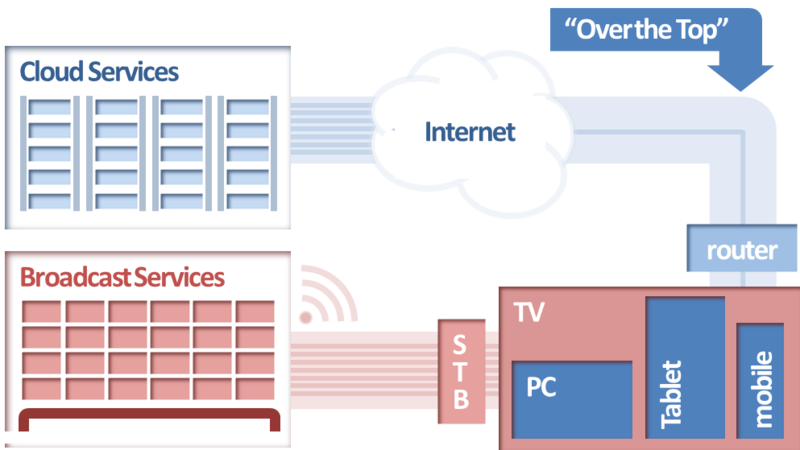 An OTT service effectively bypasses the traditional broadcast television transmission by offering content via the internet (Figure i and Figure ii). The center of this conflict was based on the sudden increase in bandwidth. Usage would increase ten-fold or even higher because of video. Because of this internet governance debate intensified. Network providers argued, “Your video is costing us a lot of money in upgrading our infrastructure. You need to pay extra for that content, or we’ll have to filter it.” These are known as paid-prioritization agreements or charging special fees for Internet fast lanes. Subscribers of ISP services typically pay a flat monthly fee for their internet connection, regardless of how much they download. OTT providers also generate revenue through monthly subscriptions. The difference is in the infrastructure cost between these two business models: As subscriber counts increases, an OTT hosting platform has the luxury of expanding their back-end proportionally. For example, if the OTT provider doubles their subscriber base, they have the revenue surplus to justify doubling their infrastructure capacity. Imagine a community of 20 ISP subscribers using an average of 1Mbps of traffic per month (20Mbps in total for the community). If that community simultaneously signs up to an OTT service then each user increases their usage to 10Mbps per month, that’s 200Mbps that now needs to be supported by the ISP. In other words, the ISP needs their infrastructure to support ten times more capacity, but none of those subscribers are paying more for their internet connection. With cord cutters it gets even worse (i.e. those that have cancelled their pay-TV service). 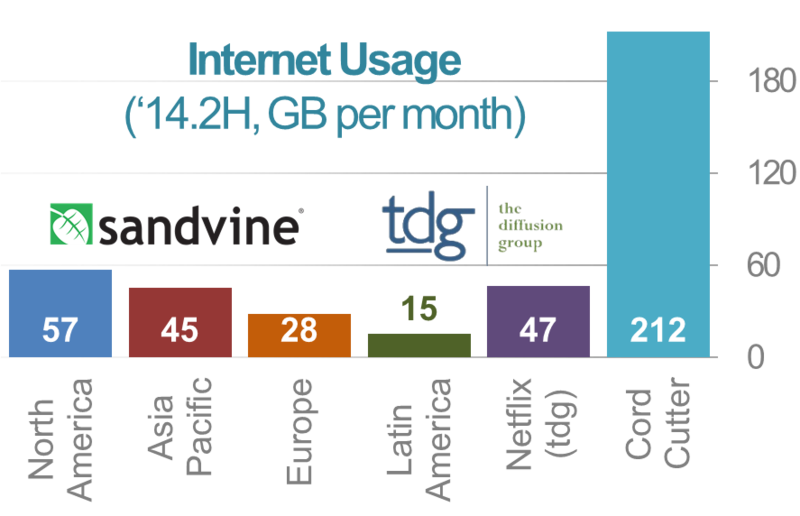 According to Sandvine’s Global Internet Phenomena Report, cord cutters “consume on average 212GB a month, more than seven times the usage of a typical ISP subscriber” (Figure iii). This is further complicated by the fact that ISPs typically over-provision (or over-subscribe) their networks to save on infrastructure costs. An often quoted figure is 20:1 for ADSL, and can be as high as 50:1 for satellite connections. In the first example, over-provisioning works on the premise that an average subscriber will only use 5% of their bandwidth over the course of one month. Even though all subscribers are told that they have 10Mbps of available bandwidth, the ISP will provision for the 0.5Mbps, which is the average. If 20 subscribers share that connection in a community, then the ISP only needs to accommodate for an average of 10Mbps for the entire community (0.5Mbps x 20 users). This saves tremendously on infrastructure costs. But if all of those subscribers sign up for OTT, then bandwidth usage skyrockets and bottlenecks results in a disappointing quality of service (QoS). The OTT provider happily collects monthly revenue for 20 new subscribers, but the ISPs now has to accommodate for the increased capacity, without any incremental revenue. Since this is a subscription service, the annuity revenue model results in relatively predicable forecasting. OTT Infrastructure managers can track the trajectory of subscriber growth to their expanding back-end. ISPs don’t have that same transparency in terms of which subscribers who will sign up for an OTT service. Subscribers that sign up for OTT can easily jump from single digit gigabytes one month, to double digit gigabytes the next (see Figure iii). On a grander scale, when hundreds of thousands of subscribers sign up for OTT, there is an exponential burden on the ISP’s backbone. Internet providers have the inconvenience of upgrading their infrastructure as OTT providers become more successful. Canadian ISP’s anticipated this dilemma by implementing a bandwidth usage cap. In 2012, four months after Netflix launched services in Canada; several ISP’s capped their internet services between 15GB and 25GB per month, prompting complaints from Netflix executives. These bandwidth caps restrict downloading to just a handful of movies per month – effectively neutering Netflix’s entry into the country. Netflix users watched over 5.1 billion hours of video per month in Q4 2014, tripling their usage compared to three years ago. In February of 2015 the Federal Communications Commission (FCC) voted in favor of a strong net neutrality rule. In other words paid-prioritization agreements are no longer allowed. This prevents ISPs from collecting payments from web companies from delivering their entertainment content using paid fast lanes. In Part IV we will gauge the health of the entertainment industry by breaking down the revenue forecasts of the music, film, TV, and gaming industries, in light of internet piracy. In Part V of this series we will propose solutions to reduce internet piracy from the vantage point of a subscriber wish-list. In the days of linear television, broadcasters had a difficult task in understanding their audience. Without a direct broadcasting and feedback mechanism like the Internet, gauging subscriber behavior was slow. Today, online video providers have the ability to conduct a one-to-one conversation with their audience. Viewing habits of consumers will continue to rapidly change in the next ten years. This will require changes in advertising expenditure and tactics. The evolution from traditional TV viewing to online video has been swift. This has significantly disrupted disc sales such as DVD and Blu-Ray, as well as cable and satellite TV subscriptions. With the newfound ability to consume content anytime, anywhere, and on any device, consumers are re-evaluating their spending habits. In this paper we will discuss these changes in buying behavior, and identify the turning point of these changes. Transcoding large video libraries is a time consuming and expensive process. Maintaining consistency in video quality helps to ensure that storage costs and bandwidth are used efficiently. It is also important for video administrators to understand the types of devices receiving the video so that subscribers can enjoy an optimal viewing experience. This paper discusses the differences in quality in popular video codecs, including the recently ratified H.265 specification. Television subscribers have come a long way from the days of channel hopping. The arduous days of struggling to find something entertaining to watch are now behind us. As consumers look to the future, the ability to search for related interests and discover new interests is now established as common practice. This paper discusses the challenges that search and discovery engines face in refining their services in order to serve a truly global audience. Broadcasting, as a whole, is becoming less about big powerful hardware and more about software and services. As these players move to online video services, subscribers will benefit from the breadth of content they will provide to subscribers. As the world’s video content moves online, solution providers will contribute to the success of Internet video deployments. Support for future technologies such as 4K video, advancements in behavioral analytics, and accompanying processing and networking demands will follow. Migration to a multiscreen world requires thought leadership and forward-thinking partnerships to help clients keep pace with the rapid march of technology. This paper explores the challenges that solution providers will face in assisting curators of content to address their subscriber’s needs and changing market demands. Ultra High Definition technology (UHD), or 4K, is the latest focus in the ecosystem of video consumption. For most consumers this advanced technology is considered out of their reach, if at all necessary. In actual fact, 4K is right around the corner and will be on consumer wish lists by the end of this decade. From movies filmed in 4K, to archive titles scanned in UHD, there is a tremendous library of content waiting to be released. Furthermore, today’s infrastructure is evolving and converging to meet the demands of 4K, including Internet bandwidth speeds, processing power, connectivity standards, and screen resolutions. This paper explores the next generation in video consumption and how 4K will stimulate the entertainment industry. VII. Are You Ready For Social TV? Social TV brings viewers to content via effective brand management and social networking. Users recommend content as they consume it, consumers actively follow what others are watching, and trends drive viewers to subject matters of related interests. The integration of Facebook, Twitter, Tumblr and other social networks has become a natural part of program creation and the engagement of the viewing community. Social networks create an environment where broadcasters have unlimited power to work with niche groups without geographic limits. The only limitations are those dictated by content owners and their associated content rights, as well as those entrenched in corporate culture who are preventing broadcasters from evolving into a New Media world. Content Protection is a risk-to-cost balance. At the moment, the cost of piracy is low and the risk is low. There are no silver bullets to solving piracy, but steps can be taken to reduce levels to something more acceptable. 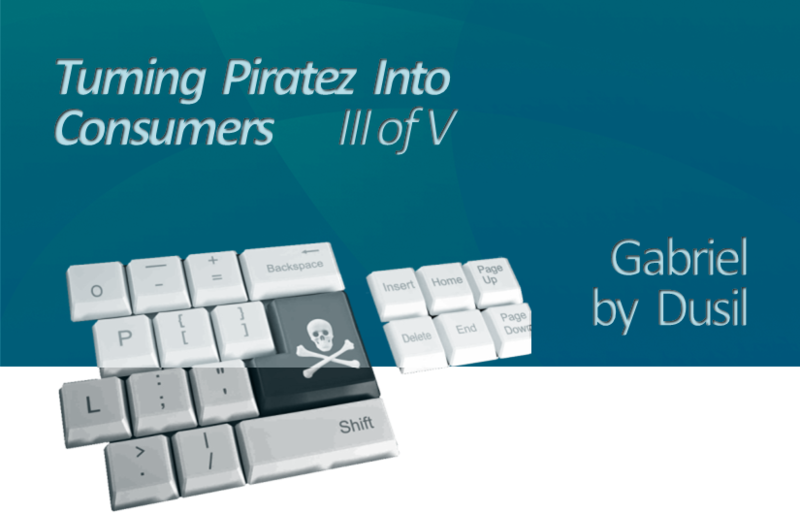 It is untrue that everyone who pirates would be unwilling to buy the product legally. It is equally evident that every pirated copy does not represent a lost sale. If the risk is too high and the cost is set correctly, then fewer people will steal content. This paper explores how piracy has evolved over the past decades, and investigates issues surrounding copyright infringement in the entertainment industry. Gabriel Dusil was recently the Chief Marketing & Corporate Strategy Officer at Visual Unity, with a mandate to advance the company’s portfolio into next generation solutions and expand the company’s global presence. Before joining Visual Unity, Gabriel was the VP of Sales & Marketing at Cognitive Security, and Director of Alliances at SecureWorks, responsible for partners in Europe, Middle East, and Africa (EMEA). Previously, Gabriel worked at VeriSign & Motorola in a combination of senior marketing & sales roles. Gabriel obtained a degree in Engineering Physics from McMaster University, in Canada and has advanced knowledge in Online Video Solutions, Cloud Computing, Security as a Service (SaaS), Identity & Access Management (IAM), and Managed Security Services (MSS). © 2015, All information in this document is the sole ownership of the author. This document and any of its parts should not be copied, stored in the document system or transferred in any way including, but not limited to electronic, mechanical, photographs, or any other record, or otherwise published or provided to the third party without previous express written consent of the author. Certain terms used in this document could be registered trademarks or business trademarks, which are in sole ownership of its owners.